The jury trial has been set for Seligman man Brian Sharp who is accused of the wreck that resulted in the death of his passenger in the fall. Sharp, 32, was charged with second degree murder, driving while revoked or suspended and leaving the scene of a motor vehicle accident with an injury on August 7 last year. On Tuesday, June 16, Sharp’s attorney’s, Darwin Groomer, of Monett, request for a speedy trial was sustained by Barry County Judge Jack Goodman. Sharp’s trial is set for Wednesday, September 16, at 9 a.m.
On August 3, 2014, the Missouri State Highway Patrol was dispatched to a motor vehicle crash on Missouri 90 two miles west of Washburn around 6:14 p.m. When a trooper arrived, a 1979 Chevrolet Corvette was totaled when it ran off the roadway and overturned. The passenger in the car, Kenneth A. Patterson, 48, of Seligman, was pronounced dead at the scene. Upon investigation, cold beer cans were found all around the car at the crash site, and a cell phone was laying on the ground. When officers made contact with the vehicle’s owner, Sharp’s mother, she gave them his cell phone number. When the number was called, the cell phone from the wreck began to ring. Sharp had multiple driving while revoked or suspended charges prior to the crash. 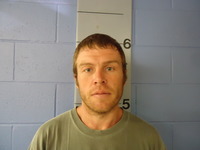 Sharp is still held in the Barry County Jail on a $100,000 cash-only bond.